But hours later, the Philippine Supreme Court maintained its decision to allow Ms Arroyo to travel overseas, turning down the government's appeal. The high court also gave the Justice Secretary, Leila de Lima, 10 days to explain why she should not be cited for contempt for refusal to comply with the order and blocking Ms Arroyo's travel. The charges on electoral fraud, which carry a maximum penalty of 40 years imprisonment, were filed by the Commission on Elections at the Pasay Regional Trial Court in Manila, a court official said. The regional court's Judge Jesus Mupas would now decide whether to issue an arrest warrant, said the commission chairman, Sixto Brillantes. He said he also asked for a court order barring Ms Arroyo's travel. On Tuesday Ms Arroyo tried to leave the country, saying she was seeking treatment for a bone ailment, but was stopped at Manila airport because she was still under investigation. Her lawyer, Ferdinand Tapacio, deplored the ''indecent haste'' and criticised what he said was the government's ''emerging pattern of persecution''. The charges stem from allegations that Ms Arroyo conspired with officials to tamper with results of 2007 congressional polls to favour her candidates. Now that charges have been filed, Ms Arroyo likely faces arrest, Senator Francis Escudero said. Ms Arroyo was recovering in the hospital since her failed attempt to leave the country on Tuesday, and it was doubtful she would be immediately hauled to jail even if the arrest warrant was issued. After stepping down last year, Ms Arroyo, 64, was elected to the House of Representatives and faced at least half a dozen complaints, also alleging she diverted state funds for her campaign and benefited from foreign contracts. Her successor, Benigno Aquino, was elected on promises to rid the Philippines of corruption and has said he wants to start with Ms Arroyo. Akbayan Party today vehemently opposes the move of the House Minority to place former President Gloria Macapagal-Arroyo under the protective custody of the House of Representatives, as these efforts may thwart the Filipino people’s quest for justice. “The people’s right to justice must take precedence over the right of a single individual. The Minority should stop treating this House as if it were a shelter for crooks, plunderers, and criminals,” Akbayan Representative Kaka Bag-ao said. “If there is anything that needs protection from this august chamber, it is the rule of law that is now being bastardized by the machinations of the people that GMA has put in key positions during her incumbency as president,” Bag-ao added. Bag-ao said she sees no reason why there is a need for such ‘special treatment,’ as the charges of electoral sabotage filed against the former president is being done through a fair and legitimate judicial process, not out-and-out political persecution. “If there is any danger that GMA should be afraid of, it is the huge possibility of a conviction and jail term as she is being made to answer for the crimes that was committed during her reign of impunity,” Bag-ao said. For his part, Akbayan Representative Walden Bello argued that Gloria has no right to special treatment. "A hospital arrest is better than protective custody. But if there is fear of real threats to her well being, the DOJ can simply increase its complement of PNP and DOJ personnel providing security for her," Bello said. Bello also pointed out that it would be unwise to bring Arroyo to Batasan, to be in especially close proximity of her staunchest allies. "At a time when all of Gloria's escape routes are blocked off, bringing GMA to Congress would open a little window of opportunity for her to plot her final escape," Bello explained. "Congressional security could not even detect the the switching of ballot boxes of the 2004 elections that were stored at the House, what chance would they have against people determined to help Gloria escape, especially that the Minority might provide insider assistance for this? The House simply is not tailored to serve as a detention center." “In these times when our commitment to the ‘daang matuwid’ is being tested, the House leadership must unwaveringly show our people that it is on the side of truth and justice by preventing any issuance of a protective custody in favor of GMA,” Bag-ao concluded. A delegation of women trooped to the Department of Justice building this morning, November 21, and presented Secretary Leila De Lima with a bouquet of flowers to congratulate her for being the “hero of the moment” in taking the initial steps to bring the former President Gloria Macapagal Arroyo to justice. “We are here to congratulate the Department of Justice Secretary Leila De Lima for successfully blocking the planned escape of the Arroyos. We also want to congratulate Secretary De Lima for standing up to the Supreme Court which was clearly acting in collusion with the Arroyos and assisting them to flee the country. Secretary De Lima is the hero of the moment.” said Emma Garcia, Spokesperson for Partido Lakas ng Masa, PLM-Women. 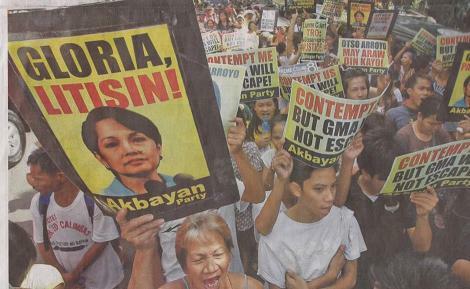 “However, we also want to deliver the message that the process of bringing the Arroyos to justice, which started with Gloria Macapagal Arroyo’s arrest last Friday, must continue right through to the end.” Garcia added. “For a start, we don’t think that GMA should be granted any special favors. Isn’t everyone supposed to be equal before the law? Those who robbed the people of their basic democratic right to vote should not be passing their time in posh places. What next? Luxury resorts? The entire system of corruption is based on this practice of granting ‘special favors’ to the rich and powerful. “We are also here to press for plunder charges to be brought against GMA. The stolen wealth of the people must be recovered and put to use for the welfare of the masa. “Furthermore, we also want President Aquino to spell out his government’s policy on the Arroyo case, so as to dispel any confusion about the commitment of his government to get rid of systemic corruption. Bringing the Arroyo’s to justice will be the most important example of the government’s willingness to implement this promise. “We must be vigilant to thwart any attempts by the Arroyo camp and their supporters in the Supreme Court at subverting the course of justice, and the people's clamor for full justice. 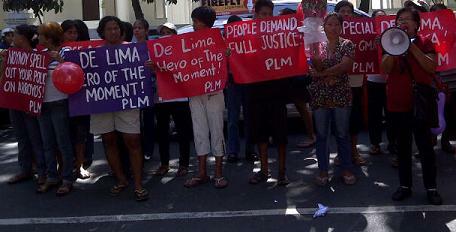 Secretary De Lima, we will stand with you in the pursuit of full justice in the interest of the masa.”, Garcia concluded. Congratulations, Secretary De Lima, for Blocking the Planned Escape of the Arroyos! No Special Favors for GMA! Bring Plunder Charges Against the Arroyos! President Noynoy Must Spell Out Government Policy on the Arroyos! The People Demand Full Justice be Served! The Partido ng Mangagawa (PM) today said it is the 99% and not former President Gloria Macapagal-Arroyo who are the real victims of tyranny and injustice in this country. Members of PM and the Philippine Airlines Employees’ Association (PALEA) held a 2:00 p.m. rally at the Our Lady of the Airways Parish at the corner of Sucat Road and MIA Road to air their sentiments on the alleged escape of the Arroyos. “Gloria was merely banned from leaving the country for a while, whereas thousands of PAL workers and several millions of contractuals, unemployed and underemployed out there are being denied the right to live decent lives,” stated PALEA president and PM vice chair Gerry Rivera. “As to PAL’s implementation of its outsourcing plan we stand by our position that outsourcing should not be implemented while the case remains pending before the Court of Appeals,” said Rivera. Unfortunately thousands of PAL workers were thrown out of work since October 1, 2011 when De Lima’s boss, President Benigno Aquino, allowed Lucio Tan to proceed in firing 2,600 its regular employees and outsource their jobs to third party service providers in clear violation of the Constitution, the Labor Code and international conventions. The only difference between the two cases, Magtubo added, is that PAL’s outsourcing was motivated by corporate greed while Gloria’s bid was a desperate attempt to escape looming imprisonment. 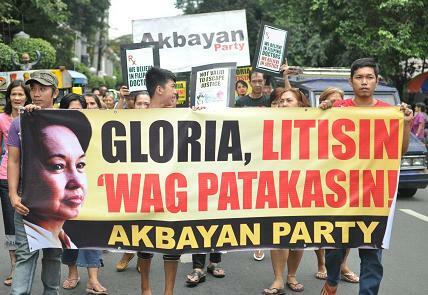 “Indeed, the country’s justice system is more ill than the ailing Gloria,” concluded Magtubo.